Posted by B. Daniel Blatt at 10:36 pm - November 12, 2012. It is fascinating how many Obama supporters criticized our candidate for his absence of specifics when the Democrat himself put forward no proposals to address some of the nation’s pressing problems. Earlier today, I wrote about his resistance to real reform. And now, I’m trying to puzzle out he could win without offering a plan for governance. Perhaps it really was his personal appeal. I keep going back to the last week of the campaign. Mitt Romney made a great closing argument. Obama talked about voting as “revenge.” The Republican outlined what he would do should he win election. The Democrat warned of the perils of electing a Republican. One had an outline of a plan. The other did not. The man without a plan won. Not a good sign for our republic. Posted by B. Daniel Blatt at 8:45 pm - November 12, 2012.
. . . it’s never a good time to make important decisions with far-reaching consequences when you’re in such a state. I think we need to get some perspective on things before committing ourselves to wholesale changes. We need some data, and we need some thinking. It strikes me that the public made a similar impulsive decision under emotional stress. Maybe we shouldn’t be as hasty. He’s right; we shouldn’t be hasty in deciding the way forward. That said, we’re already beginning the process of considering the way forward. Now is perhaps the time for consideration, to put ideas out there. Later will come the time for action, choosing which ideas to adopt and determining the best ways to put them into practice. UPDATE: In a similar vein, Peter Wehner believes . . .
. . . we should use this moment to encourage fresh thinking and not vilify those who engage in it. At the same time, it seems to me that trying to fully understand the consequences of this election and what it means for conservatism 72 hours or so after the vote is probably unwise. We have plenty of time to sort through the exit polling data and think things through in a prudent manner. Posted by B. Daniel Blatt at 8:14 pm - November 12, 2012. In honor of that resolution, I believe we should gather for a steak dinner at a Los Angeles restaurant next Monday. Please let me know if you’re interested so I can begin planning. 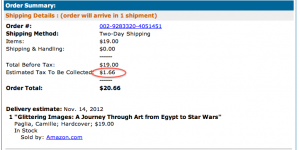 Posted by B. Daniel Blatt at 7:48 pm - November 12, 2012. It seems that, since 1896, there have been four distinct presidential election cycles during each of which one party remained dominant. In the nine elections from 1896 to 1928 (inclusive), Republicans won seven with Democrats winning only in 1912 and 1916, neither time with a popular vote majority. In the nine elections from 1932 to 1964, Democrats won seven and Republicans won twice, both times with a war hero at the top of the ticket. From 1968 to 1988, Republicans won five times, with Democrats winning only once — and then with a narrow majority. From 1992 to 2012, Democrats won four times, Republicans twice, only once with a popular vote majority. This notion of cycles came to mind in an e-mail exchange with a reader when we compared the most recent presidential campaign to that of 1964. In both years, the Democratic incumbent ran a very negative campaign, effectively demonizing his Republican opponent. Does that incumbent’s failure to run on ideas suggest that his party is intellectually exhausted — or that its leadership understands the party’s ideas are at odds with those of the American people? There is a lot of intellectual ferment on the right; we see it even as conservatives begin reconsidering comprehensive immigration reforms. Save for U.S. Senator Ron Wyden (D-Ore), it seems the only elected officials in Washington putting forward real ideas for reform are Republicans. Maybe Obama’s negative campaign of 2012 does indeed signify the end of an era. One can only hope. Posted by B. Daniel Blatt at 2:57 pm - November 12, 2012. “The president,” wrote Jennifer Rubin yesterday, “who ran with no agenda and is now a lame duck, has not distinguished himself by tackling tough problems.” His reelection campaign made his, as his campaign manager put it, the party of “the micro stuff“. WIth such a small ball focus, Obama doesn’t seem willing to address the big challenges facing our country, notably the coming insolvency of entitlements, out-of-control federal spending and the increasing burdens of the regulatory state. The sound and fury will be over big fights on taxes and spending. They will look like replays of the last four years and not end up accomplishing much. The big changes to our economy will be the metastatic expansion of regulation, let by ACA, Dodd-Frank, and EPA. There will be no change on our long run problems: entitlements, deficits or fundamental reform of our chaotic tax system. 4 more years, $4 trillion more debt. Why? I think this follows inevitably from the situation: normal (AFU). Nothing has changed. The President is a Democrat, now lame duck. The congress is Republican. The Senate is asleep. Congressional Republicans think the President is a socialist. The President thinks Congressional Republicans are neanderthals. The President cannot compromise on the centerpieces of his campaign. Result: we certainly are not going to see big legislation. Anything new will happen by executive order or by regulation. Posted by B. Daniel Blatt at 1:18 pm - November 12, 2012. Posted by B. Daniel Blatt at 12:54 pm - November 12, 2012.
. . . another $1.1 trillion deficit for the year that ended September 30, which was the biggest deficit since World War II, except for each of the previous three years. President Obama can now proudly claim the four largest deficits in modern history. As a share of GDP, the deficit fell to 7% last year, which was still above any single year of the Reagan Presidency, or any other year since Truman worked in the Oval Office. 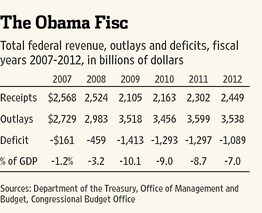 As point of reference, the federal budget deficit for the preceding fiscal year, 2006, was $248 billion. In other words, while the divided Congress of then-President Bush’s first two years in office ramped up spending, the more Republican 109th Congress exercised greater fiscal discipline. Only with the election of a Democratic Congress in 2006, responsible for passing the FY 2008 budget, did spending start to increase and deficits burgeon. As the chart shows, we wouldn’t see any decline in the deficit until FY 2012, the first year in which a Republican chamber of Congress had a hand since FY 2007. Worth repeating that FY2009 belongs to Obama because His signature is on it, not Bush’s. The Democrat Congress held it back from Bush’s signature, so that Obama could increase the spending, when He took office in early 2009. Posted by B. Daniel Blatt at 3:38 am - November 12, 2012. It is not often that I strongly disagree with Bruce. No, we should not give the Democrats what they want on the economy. It’s going to be bad enough that they pretty much got what they wanted during Obama’s first two years in office. And we’re only beginning to see the consequences of that legislation, with Obamacare causing businesses to restructure their workforces and Dodd-Frank threatening the survival of community banks. And then there’s the additional burden of the numerous regulations the Obama administration has been pushing. People will soon see the damage wrought by Democratic policies. We don’t want to make it even more difficult for our friends out of work and struggling to survive. What House Speaker Boehner needs to do is not give Obama what he wants, but instead lay down a marker to show where Republicans stand. And not yield. And we know tax increases only give Washington politicians excuses not to cut spending. The Ohio Republican said on Wednesday that “the GOP won’t accept tax increases, though it will accept changes that eventually would increase revenue through a more efficient tax code.” He must know that if he yields, some conservatives will clamor for new leadership. When Boehner wins on this, he will give conservatives something to cheer about, to show that conservatives can stand up to the reelected president and remain a potent force even after the disappointing results of last week’s election. The Democrat will know that the Republican Speaker is no push-over, keeping him on his toes. Posted by B. Daniel Blatt at 2:25 am - November 12, 2012. Seems laws President Obama opposes may have helped secure the Democrat’s reelection. At his American Enterprise Institute blog, Carpe Diem, University of Michigan economics professor Mark J. Perry reminds us that the incumbent opposes right-to-work laws, legislation which “protect employees from being fired for refusal to pay union dues or fees”. were responsible for 72% of all net household job growth across the U.S. from June 2009 through September 2012. If these states’ job increase had been no better than the 0.85% experienced by forced-unionism states as a group, the nationwide job increase would have been less than half as great. And the President wouldn’t have been able even to pretend the economy was in recovery. Posted by B. Daniel Blatt at 1:14 am - November 12, 2012. Eight years ago, with the defeat of then-Senate Minority Leader Tom Daeschle in South Dakota, Harry Reid took the helm as head of the Senate Democrats and soon became the obstructionist-in-chief even though his party held only 45 seats in the U.S. Senate. And Senate Republicans can just say they’re following in Mr. Reid’s footsteps. Do hope Senator McConnell’s staff have been busy collecting Senator Reid’s remarks from that year — and the various editorials (particularly from the New York Times) praising the Nevada Democrat for his intransigence. They would serve to remind the Democrats of the merits of Republican “obstruction” (for that it was the Democrats will call a Republican adoption of their strategy).